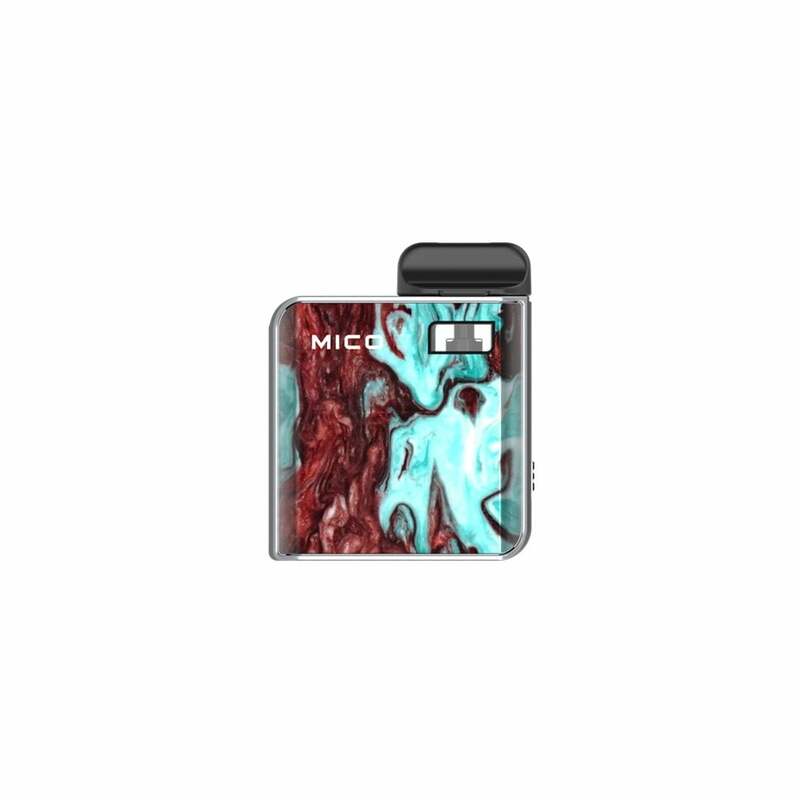 SMOK Mico Pods are compatible with the powerful but compact SMOK Mico Pod Kit. There are three resistance options available, each specifically designed to give you the best flavor and hits with that resistance. All pods have a 1.7ml nic salt juice capacity and come in a pack of 3 pods. The 0.8ohm Mico Pod is made with a mesh coil for faster heating and huge vapor clouds. The 1.0ohm pod is made with hi-quality cotton and is designed for great MTL hits. The 1.4ohm Mico Pod is made with heat resistant ceramic great for high wattage and for a longer lifespan. No matter which coil you choose, the SMOK Mico will impress you with its long-lasting battery and smooth throat hits. Remember to prime your Mico coil for 3-4 minutes before using to allow the wick to completely saturate. How long do SMOK Mico pods last? Mico pods will last around 1-2 weeks on average when primed correctly. However, the life of pods depends on the frequency of use. The SMOK Mico is the newest addition to SMOK's formidable line of AIO (all-in-one) and pod system vape kits, featuring a rechargeable 700mAh lithium ion battery, stylish resin design, and two refillable pod resistance options. Compact, yet power, the SMOK Mico is an ideal mini vape for those on the go. Comes with one 1.0ohm coil & 0.8ohm mesh coil Mico pods. The SMOK Mico sports a 700mAh battery that's nearly twice the size of the popular SMOK Novo kit, allowing for even longer periods of vaping without having to charge. Charging is easy, as the SMOK Mico pod system is charged via microUSB cable included in the packaging. The square shape of the Mico makes it easy to carry around in any bag or pocket and its unique resin panel design gives the Mico an eye-pleasing aesthetic. Two pods are included with the Mico kit: one 1.0ohm coil pod for MTL vapers and one 0.8ohm mesh coil pod for those looking for a bit more volume and warmth in their vape. Just fill with your favorite nicotine salt juice, wait for the cotton to wick (3-4 minutes), and vape away, with the SMOK Mico pod mod kit. Each resin pattern is unique to the individual kit. Mico pods will last around 1-2 weeks on average. However, the life of pods depends on the frequency of use. Perfect easy usable device !! Battery length is also amazing! Thanks you guys! Nice Mico pod mod. I put vape salt in 1 pod, and vape juice in the other. Works great for both. Mesh are definitely the best tasting and hitting pods for the mico, the ceramics aren't really good. The overall quality of the mico is pretty good but mine has a weird build quality, any time I give the pod system a semi-hard squeeze it clicks which I find pretty annoying, other than that it's a pretty good buy. This little guy is a champ. Great flavor and long lasting pods. Had a Mi-pod, didn’t like the flavor and pods were burning after first refill. Great upgrade for less price. Recommend! I did not like it definitely for DTL only you have to take a huge vape to get it going the auto fire is not sensitive at all. If you are an MTL person like me get the MI Pod the auto fire works right away. I’ve been using my Mico for about 2 days now and I am really loving this little pod device. It’s made very well and the draw on it is nice and smooth. I’ve not seen any leakage of eliquids unlike my Nord, which I still enjoy very much, where I have to check under the pod a couple times a day and clean the small trace of eliquids I sometimes find around the metal connector posts. The Mico so far does not leak any ejuice in my mouth when I puff like the Nord does at times. There’s no air flow adjustment other than which ohm pods you use to loosen or tighten the draw. The mesh 0.8 pods have a looser air flow & produce more vapor and the flavor with the mesh is superb! The 1.0 regular pod has a tighter draw and flavor is slightly diminished, but it’s still a great vape. I just ordered the 1.4 ceramic pods to try but I have a feeling the mesh will be my favorite and 0.8 ohm is still good with the lower mg Nic Salts, but 50mg salts might be a little harsh. I put a 40mg Nic Salt in my Mico with the mesh pod and it’s a tad harsh compared to 35mg and below. This is the first pod device where you have to switch out the whole pod rather than just a coil that I have been able to switch flavors in ejuice without having to replace the whole pod just so the flavor of the 1st ejuice doesn’t intrude on the flavor of the new ejuice. I am very impressed with that! I recently bought a Lost Vape Orion Q pod mod before I bought the Mico and I prefer the Mico hands down. The only thing on the Mico I wish was different is I wish the mouthpiece was a little bigger in height, but aside from that I find the Mico to be another excellent pod mod by Smok, who has been smoking the competition lately when it comes to producing excellent pod devices....pun intended.